In October 1952, Soedarpo Sastrosatomo established NVPD Soedarpo Corporation, his first business line that works in trading, import and distribution. On 1 March 1953, Soedarpo took over NV ISTA (Internationale Scheepvaart Transport Agenturen) and became the Managing Director. In November later that year, Soedarpo created Indonesia Stevedoring Ltd (INSTEL). In 1956, INSTEL acquired Stroohoeden Veem (which then became PT Sinar Harapan Veem Indonesia - SHVI), the biggest stevedoring and warehousing company in Surabaya at that time. On 13 November 1964, through ISTA, INSTEL, Soedarpo started PT Perusahaan Pelayaran Samudera "Samudera Indonesia", which he held as President Director until the year 2000 and as President Commissioner until his passing in 22 October 2007. 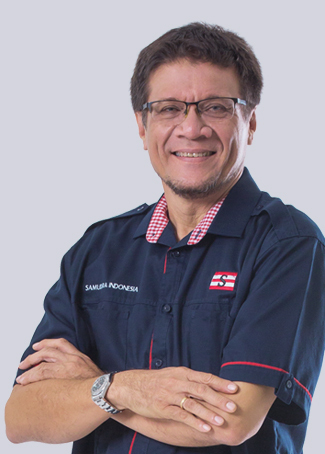 Throughout his career, Soedarpo was active in various professional and social organizations, among others as the General CHairman of INSA (Indonesian National Shipowners' Association). Soedarpo was also known as one of the District Governors Rotary International in Indonesia, and founder as well as the Chairman of the Rotary Indonesian Foundation. In 1985, Soedarpo received the "Orde Van Oranje-Nassau" award from the Kingdom of Holland for his services for the community. In 1995, he received "Bintang Mahaputra Pratama" from the President of Indonesia. In 28 September 2000, Soedarpo was honored to be in the "Asia Maritime Hall of Fame" as an award for his career in building Samudera Indonesia as one of the well respected players in the Asian maritime industry. Actively participating in creating job employment, and developing the competence of human resource skills. To ensure sustainable business growth, and deliver additional value to the shareholders. Positively contributed to the economic growth in Indonesia, by providing efficient logistics solutions. Providing transportation services, to meet the demand of distribution activities all over Indonesia. Established PT Samudera Daya Maritim, PT Satuan Harapan Indonesia, PT Samudera Laksana Perdana, PT Samudera Kendari Logistik, PT Samudera Minang Logistik, PT Samudera Banjarmasin Logistik, PT Masaji Tatanan Kontainer Indonesia, PT Samudera Asahi Shipping, and PT Samudera JWD Logistics. PT Samudera Indonesia Tbk conducted a stock-split in a ratio of 1:20. Restructured business unit in Terminal business. Established a port management support service business unit. Established a special business for shipping agency business. The establishment of Samudera Logistics DWC LLC in Dubai, United Emirates Arab. The establishment of PT Samudera Bandar Logistik in Tanjung Priok, Jakarta. The establishment of PT Samudera Properti Indonesia as the land and building asset management company. Signed an MoU for the construction of multipurpose terminal in Samarinda. The establishment of PT Samudera Amanah Tanker and started to operate the gas tanker MT Sinar Tarakan. The establishment of PT Samudera Terminal Indonesia. PT Samuder Rekso Asri built Samudera Residence Depok. PT Wahana Jaya Samudera is officially founded as a business unit of Samudera Shipyard. Established a joint venture for terminal services development in Samarinda. Born in Tasikmalaya, April 23rd, 1946. Effectively been serving as President Commissioner of the Company since 2009. He graduated from the Indonesia Merchant Marine Academy in 1970. He joined PT Samudera Indonesia as an Officer in 1971 and later held the position as Captain of the Company's vessel. 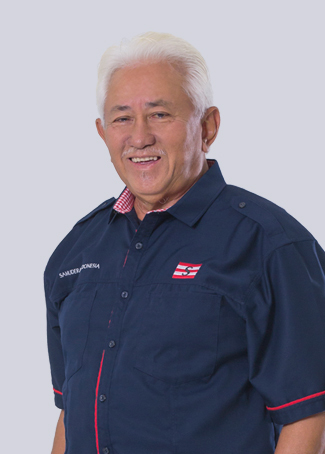 Throughout his career he has served among others as Corporate Managing Director, Logistics Group (1990-2010), before appointed as Director of PT Samudera Indonesia Tbk from 2010 until today. Other positions currently held are Executive Chairman Samudera Shipping Line Ltd, Commissioner of PT Masaji Parayasa Cargo, PT Silkargo Indonesia and PT GAC Samudera Logistics. He also serves as Director of PT Ngrumat Bondo Utomo since 2008. In the field of organization, he has been active as Chairman of the ASEAN Federation of Forwarders Associations (AFFA) for the period 2008-2010 and is still active as a Member of the Board of Trustees of Logistics & Forwarders Association of Indonesia (ALFI) and Advisory Board Members Indonesian National Shipowners' Association (INSA). Born in Jakarta, June 16, 1976. Served as Commissioner of PT Samudera Indonesia Tbk since June 2, 2016. He graduated from Industrial Engineering of Faculty of Engineering, Universitas Indonesia (1999). He began his career in Soedarpo Informatika as Business Process Analayst and Business Representative in San Diego, USA (1999 – 2001). He continued his career as IT Consulting Service Director (2005 – 2006) and President Commissioner since 2008 till now. He also served as President Director of PT Bayu Buana Gemilang , a private national company in upstream gas sector in 2008 – 2014. In 2009 and 2001 he was appointed as a judge of “101 Inovasi Indonesia” by Ministry of Research and Technology Republik Indonesia. In 2014, he was chosen as one of “50 Inspirational Figures” Engineering Faculty of Universitas Indonesia. He is currently active as a guest lecturer there. Indonesian citizen, born in Jakarta on December 28, 1955. 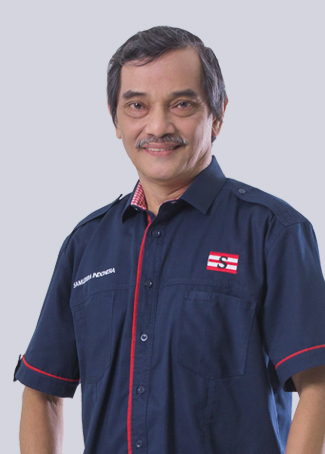 He obtained a bachelor degree in Sanitary Engineering from Institut Teknologi Bandung in 1983 and an MBA degree from IPMI - Monash University in 1999. He started his career at PT Sucofindo (Persero) from 1984 until 2008 with the last position as President Director. He then pursued a career with PT Asuransi Bintang Tbk as President Director, and currently serves as Commissioner. He actively participated in various seminars, training, upgrading courses, workshops, conferences, national and international, such as Information Technology, Leadership, Management, Environment, and others. During his career, he was once stationed in Calgary, Canada, for one year. He is also active in various organization, among others, in Indonesian Association of Engineers in Environment Engineering, Alumni Association of IPMI, and the Association of Independent Surveyor Indonesia (AISI). Born in Jakarta, April 9th, 1948. She has been serving as President Director of the Company since 2007. She holds a Diplom Ingenieur (Dipl.Ing.) from University of Technology Munich-Germany (TU-Munich), majoring in Computer Sciences in 1974. 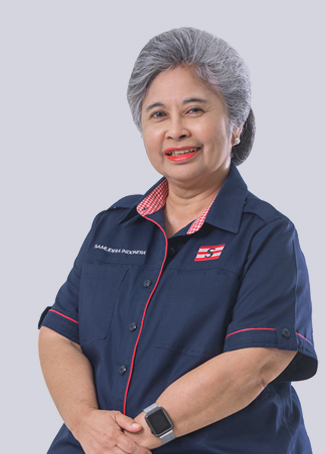 Prior to serving as Director of the Company, she also held positions as President Commissioner of PT Samudera Indonesia Tbk, PT Asuransi Bintang Tbk since 2008, President Director of PT Ngrumat Bondo Utomo, as well as the Commissioner of PT Inter Pariwara Global dan since 2014 served as Commissioner PT iLab Komunikasi Indonesia. Currently, she holds a number of concurrent positions, such as Founder and Member of the Executive Board of Singapore Chamber of Commerce Indonesia (SCCI), Chairman of Indonesia-Belgium, Netherlands, and Luxembourg Chamber Executive (INA), Honorary Board Member of German-Indonesian Chamber of Industry and Commerce, Board Member of The Nature Conservancy's Asia Pacific Region (APC-TNC), Founder & Chairman of Yayasan Fitrah Bisnis Keluarga Nusantara, and also Founder and Board of Directors of Family Business Network Asia (FBN Asia). In the field of education, she is currently a Board Member of INSEAD Southeast Asia School of Management (Fontainebleau/France-Singapore), Chairman of the Supervisory Board of Yayasan Pendidikan dan Pembinaan Manajemen (YPPM), a Board Member of the School of Business and Management ITB, and Advisory Board Member of AIESEC Indonesia, Supervisory Board Member of Sanata Dharma University, Yogyakarta, President's Advancement Advisory Council Member of the National University of Singapore (NUS), and one of the founding members of the Wharton e-Fellow. In 2002, she was awarded "Woman Inspire Award 2002" in the Information Technology Sector in the Asia Pacific region by Singapore Women Business Connection (WBC). At the 15th Annivesary of TNC Indonesia on 20 December 2006, the "Nature Steward" Award was officially conferred to her for her leadership and dedication in nature conservation in Indonesia. On November 2009, she was named as "2009 Woman Enterpreneur of the Year" at the Asia Pacific Entrepreneurship Award 2009 Indonesia, organized by Enterprise Asia. In July 2013 she was awarded the "Ganesa Wirya Jasa Utama" Award as a form of appreciation from Institut Teknologi Bandung (ITB) for her achivement in the development of entrepreneurship in Indonesia. In March 2016, she was conferred "The Order of the Crown" by the Kingdom of Belgium for her services in developing the business cooperation between Belgium and Indonesia as part of her duties as Chairman of Indonesia-Belgium, Netherlands, and Luxembourg Chamber Executive Board (INA). Born in Jakarta, February 25th, 1980. He has been serving as a Director of the Company since 2009. he studied Economics majoring in Management at University of Indonesia, and proceeded to Deakin University, Melbourne, Australia to study Finance. He currently serves as Managing Director of PT Ngrumat Bondo Utomo and PT NBU INdonesia Utama. 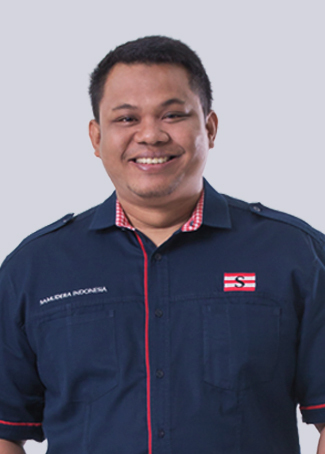 In addition, he also serves as Director of PT Perusahaan Pelayaran Nusantara Panurjwan, PT Galangan Kapal Yasa Wahana Tirta Samudera, PT Samudera Indonesia Logistik Kargo, PT Samudera Rekso Asri, PT Tata Bandar Samudera dan PT Samudera Daya Mitra. He also holds the position as President Commissioner of PT Samudera Energi Tangguh and PT Samudera Amanah Tanker, Commissioner of PT Praweda Ciptakarsa Indonesia, PT Sosial Enterprener Indonesia dan PT Indonesian Marine and Delegate Commissioner of PT Samudera Indonesia Tbk since May 22nd 2013. In organization, he is active as a member in Indonesian Chamber of Commerce and Industry (KADIN) on Marine Transportation. He is also active in the Young Presidents' Organizatin (YPO), serves as Chapter Chair of YPO Pan Indonesia Chapter 2015-2017 period. Born in Jakarta, July 28th, 1953. He has been serving as a Director of the Company since 2011. He graduated from the German School of Applied Computer Science (Fachhochschule) in 1975 and then graduated from Bandung Institute of Technology majoring in Mathematics in 1985. He started his career at NVPD Soedarpo Corporation from 1975 to 1987. He joined as Commissioner from 2009, then continued his career as Director of the Company since 2011. In addition as a Director of the Company, he also held various positions in the Company's subsidiaries, such as Director of PT Tata Bandar Samudera, Commissioner of PT Galangan Kapal Yasa Wahana Tirta Samudera, PT Samudera Energi Tangguh and PT Tata Mitra Samudera. He has served as an Independent Commissioner of PT Asuransi Bintang Tbk from 2006 to 2012. He also serves in several companies including Director of PT Inti Samudra Prakarsa (Telecommunication Infrastructure Provider) since 2003 and a Director of PT Branusa (Quantity Surveyors & Construction Cost Consultants) since 1994, as Commissioner of PT Assindo Perniagaan Internasional.